Photo+Map Lite 1.4.1 has been approved by the AppStore review team. The update bring for the first time in my set of applications the "In App" purchase that Apple introduced a while ago. Now you can directly upgrade from the Lite version to the full version by purchasing the unlock addon directly from the Lite version. 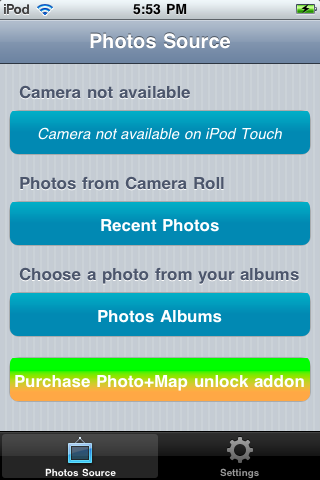 After the transaction is completed, Photo+Map Lite will have exactly the same set of features of Photo+Map. The addon purchase is simply done by tapping the purchase button on the main screen as shown below.